I've been taught that various taste can be countered with others. For example, if something is too acid or spicy I could bring it back down with fats and sweetness. I understand that there are abundant ideas surrounding these balances with many overlaps along with many radar charts and star graphs (some of witch I'll include); but whats the reasoning behind them? Do they mask the other contradicting flavours, meld with them, or is there a chemical reaction causing for it to mellow and or enhance the flavour? Is it just perceived to us weaker or stronger instead of actually being that? Possibly and most likely a mixture of both and many other factors, chemical, perception, placebo and more. What's the reasoning that some flavours balance others. Additions for clarification: When I say perception in the question It's more in the sense of how having something bitter before something sweet will make the sweetness shine through seemly infinity more than having the sweet item alone. This is a noticeable change regardless of personal preference. Even if the sweet tooth thinks it could be sweeter and another person thinks it's too sweet, they both will notice a change in sweetness if severed the bitter before hand, making both tasters perceive it tasting sweeter than it would without the bitter. 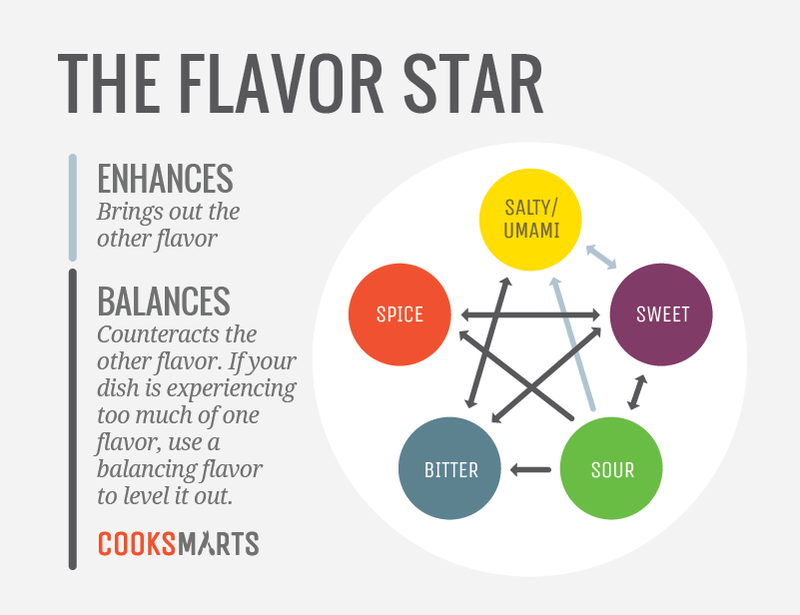 The star-charts are woeful oversimplifications as different foodstuffs producing one flavor affect different products producing a different flavor differently. First, you have the products in physical interaction. Solvents dissolving solids, definitely intensifying the taste, or embedding grains of insoluble solids isolating them, changing texture which does contribute psychologically too, e.g. solidifying a 'goo' into something chewy, bubbling to make it fluffy etc. Then there's chemical interaction. Different substances react, either removing or introducing flavors, depending on their sources. Then you add the third component - your taste buds. Again, they can be physically isolated, coated by a layer of fat, or cleaned and with increased blood flow intensifying taste, e.g. through liquors, but also their chemistry may be affected by chemicals of one food, so they react to a different food differently. Double this up, with the aroma. While the sense of smell is located in the nose, not in mouth, the scent definitely affects the perception of taste, and substances providing it undergo all the same interactions. Next comes genetics. Not everyone has the same taste buds. Example: Broccoli for most people tastes normally, for a specific percent it's impossibly bitter - there's a genetic difference between the chemistry and build of taste buds of different people, so they may react to given substances differently. And then there's what you called 'placebo effect' and perception. The concept is called Qualia. Our interaction with the reality is 'filtered' through our mind, and shaped into our perception - and this is an individual thing, where a lot of factors completely independent from the subject perceived are a factor. It will be aesthetics, it will be mood, associations - memories, similarities, habits, there will be expectations, habits, cultural influences - all kinds of factors that will modify the way we perceive the reality - including taste. The pleonasm of "Different people like different things." If you taste chicken, how are you to know, that if a different person eating the same piece of chicken perceives it identically? While the chicken composition and texture is the same, the brain through which the sensation of flavor is transferred, isn't. Its neural links were shaped through different experiences, different memories and associations, and the same 'raw input' can produce completely different output on the 'conscious layer'. So, back to your original question - you can 'engineer' a lot of these interactions. 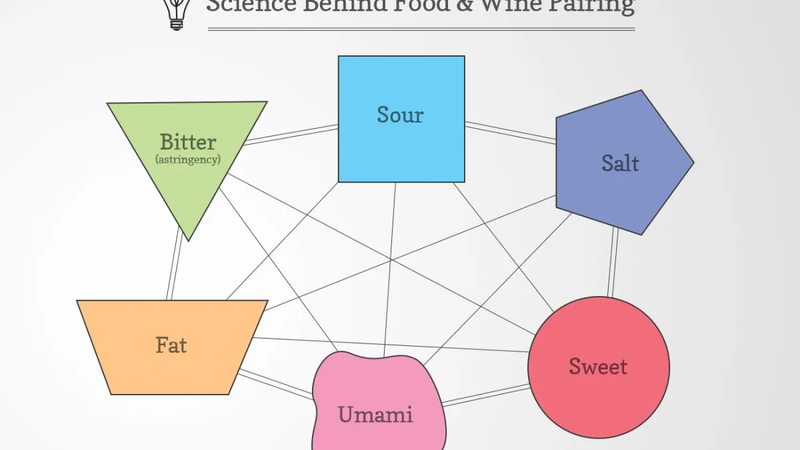 Knowing how given products interact with each other and taste buds, you can create the mix that for most people will affect the way their taste buds act. And you can 'engineer' the surroundings: appearance of the dish, impression of the serving and location; a neat restaurant with food nearly arranged on fancy plates will automatically make one perceive food as better than the same food served in a dirty stall, mixed in a slop bowl. It will never work for everyone, as people are different, but you can achieve the effect you intend with most. This topic will be open to a lot of varying opinions, simply because everyone has (to some degree) thier own interpretation of what a flavor is (or isn't). For instance, my understanding is that "umami" puckers your mouth, something similar to a Dill Pickle. A person who eats Dill Pickles on a regular basis, would become less affected by the mouth puckering than someone who was trying their first one. Likewise, since I don't like the "bitter" taste of Coffee, I drink a lot of soda. As a result, while I recognize the sweetness of sugary confections, someone who does not drink soda or eat candies will be put off by items containing excessive sweeteners. As for one flavor attribute masking or altering your perception of another.... perhaps the most important word there is "perception". If you eat a meal that is particularly spicy (far more than you are accustomed to), you may find that drinking water will only make things worse, but milk will help cool your taste buds down. Beer generally works for extra spicy things as well, if you are old enough and like the flavor of beer. But, does it actually work, or is the milk/beer just washing the undesirable spiciness off your taste buds? When cooking, if you add too much salt to a recipe, you can add potato. The potato absorbs salt, so the finished dish is repaired (in a manner of speaking). Of course, not all recipes lend themselves to having potatoes combined with the other ingredients. One way to avoid this is to measure the seasonings off to the side into a seperate dish. If you ever wonder why cooking shows have everything set up in their own little dish, this is why. It's easier to re-measure the salt in a seperate container than try to repair a recipe because the salt clumped and then dumped too much into your saucepan. Along the same lines, my Mother's Spaghetti was too acidic for my Father's ulcers. Adding shredded carrot, or sugar, would reduce the acidity and make it easier for Dad to digest without negatively affecting the flavor. Not the answer you're looking for? Browse other questions tagged flavor food-science tasting or ask your own question. What happens chemically when flavours 'mingle'? Do eggshells let flavours pass through during boiling? Why do all meal replacement drinks have sweet flavours? Do flavours get absorbed by meat, poultry or fish when cooking a stew?